Dr. Martina Nicolls is an international educator and science writer. 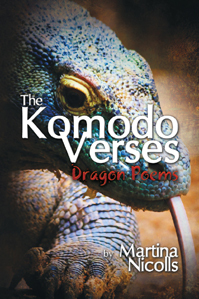 Her collection of 18 poems, The Komodo Verses: Dragon Poems, delves into the habitat and habits of the largest lizard in the world: the Komodo dragon. Unique to Indonesia, this magnificent reptile is vulnerable to extinction. These insightful poems describe the Komodo dragon in a scientific way. Learn about its scientific name, its description, what it eats, where it lives, how large it grows, how much it weighs, how it walks, and how young dragons are born. Perhaps the more we learn about the Komodo dragon, the better its chance for survival.